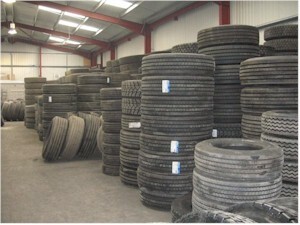 A L Tyres specialise in commercial and industrial vehicle tyre casings. 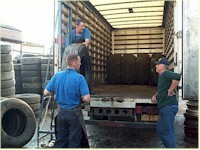 We buy in used tyres which are graded and listed ready for resale to destinations in the UK and World-wide. Our quality standards are very high with our three top inspectors having a total of over 100 years experience between them in the tyre business. On arrival each used tyre casing is individually inspected for general overall condition and tread depth. All used tyres must have even shoulder to shoulder tread wear. Tyres are rejected if they have any sidewall cuts, weathering, ripped beads or external and/or internal separations. On arrival at the depot, tyres are listed, sorted and stored according to tyre grade, brand and size. This facilitates our customer ordering and dispatch processes. 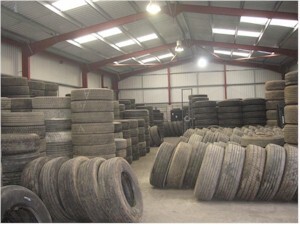 We hold large stocks of used tyre casings. These include most of the popular makes including Michelin, Goodyear, Bridgestone, Continental and Dunlop. 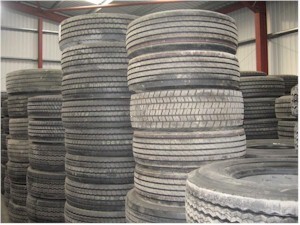 In addition our stocks include a wide range of tyre sizes and speed rating. Our used tyre grading system allows our customers to select the quantity and quality of used tyre at a price that they can afford. Every day we are packing one or more container boxes with up to 250 casings for despatch either across the UK or internationally, including export to Europe, USA and South Africa. What ever your requirement we will be pleased to give you a quote by phone, email or fax. Subsequent orders can be placed in the same manner. See our Contacts page for phone email and fax details. If you are interested, give Adrian, Simon or Matthew a call on +44 (0)161 477 5813, or fax or email us. Want to get those old truck tyres off your hands? We will buy your worn or part worn tyres and casings. Let us know what you have for sale and we'll give you a price, and if required come and collect or arrange for collection. 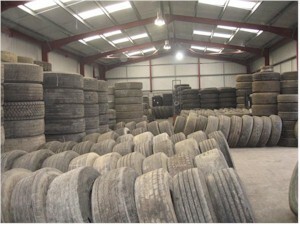 Our operation includes import of tyres and casings for subsequent resale. Alternatively if you live locally, why not drop in and see us. Bring your old tyres and we'll give you a price on the spot. Either way, give Adrian, Simon or Matthew a call on +44 (0)161 477 5813, or fax or email us. See our Contacts page for details, and where to find us. Tyres don't last forever. But why scrap them when they can be reconditioned? A retreaded tyre, produced to the same quality as a new tyre, uses a third of the raw materials and is cheaper to produce. Environmentally and financially this make sense. So, why not get us to call and inspect your worn tyre casings and determine whether they are suitable for retreading. As part of the service we will take your old tyre casings and replace them by reconditioned tyres of similar specification, or even change the specification to another tread pattern (industrial or highway) or a different size, load or speed rating. If you are interested in reconditioning your old tyres, give Adrian, Simon or Matthew a call on +44 (0)161 477 5813, or fax or email us. See our Contacts page for details of how to contact us.